LG’s 21:9 UltraWide Monitor Named Global Number One Seller for the Third Straight Year. We just got the great news. Number one in global sales for three straight years is quite an achievement, but then again, an LG 21:9 UltraWide is quite a monitor. With these IPS-based monitors professionals can multitask with as many programs as they like, and numerous video feeds, on one screen at the same time. They make work environments much more convenient and maximize productivity in any field of business. Our 21:9 UltraWide monitors provide a super-efficient environment for Microsoft® Office programs, such as Word, Excel and OneNote. A single monitor can show 47 columns and 63 rows in Excel so users can see all the content without scrolling or hiding functions of columns and rows. And for Mac OS X users, the monitors can provide selectable screen ratios, changeable by a single click, for incredible ease of use. And you get the Thunderbolt 2 interface as well. And so we extend a big THANK YOU to our worldwide customers for three years of amazing sales. 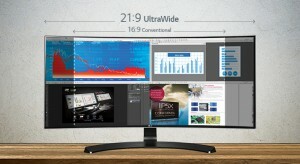 Learn more about LG’s global number one selling 21:9 UltraWide monitors here.